On to the first message. All three of them have cats at home, so the listener would like to hear the girls talk about them. People often say that pets resemble their masters, so the girls are asked to point out any similarities between their pets and themselves. Nacky feels like Juice=Juice is a group made up of cat owners, as opposed to the heavier preference towards dogs in H!P as a whole. However, it turns out that it’s just her two guests who own cats in Juice=Juice. KanaTomo‘s cat is a male named ‘Nekotarou’, though more commonly known by his nickname ‘Nuntun’. He’s pretty chubby, weighing in at about 8.5-8.8 kg. KanaTomo: Yeah, he is quite heavy. Karin-chan’s Jasmine is light and slim, weighing in at around four kilos. She was a stray cat that they picked up as she was injured, though she’s healed and is completely fine now. Karin-chan feels that Jasmine has such a beautiful face that she could be a model – though Karin-chan admits that she may be more than just a bit biased. Nacky‘s Luna-chan adorns her phone’s lockscreen. Luna-chan’s legs are stumpy, which makes her look uncool. But she’s still cute! The next letter asks the Juice=Juice members about how they’re feeling about their upcoming Budokan concert. When they first started on their 220 performance project with the Budokan as their goal, they had no idea whether it would actually happen or not. Nacky asks them how they see the Budokan. For Karin-chan, the first concert she ever went to was a Matsuda Seiko concert at the Budokan. To her, it’s a place that shines, a place where amazing people perform. So even though they’ve already established the setlist, the fact that they’ll actually be performing there still hasn’t really hit her yet. Nacky gives them some words of advice: to build up their stamina, to not be nervous, and to do their best at the Budokan. In this segment, Nacky asks her guest to talk about what they think about her. Karin-chan feels that when Nacky dances, the range of motion Nacky has when moving her hips is second to none. Nacky admits that her hips do cover a wide range of motion, though she doesn’t know why – she’s just dancing her heart out, is all. KanaTomo hails from Saitama, just like Nacky. She connects Nacky with the region, particularly since she became the Chichibu Oh! En ambassador. Especially since at the office, there’s a huge poster of Nacky in that role. Which reminds Nacky – when they had a Satoyama event at Isumi in Chiba prefecture, the people from Chichibu came bearing delicious grapes. 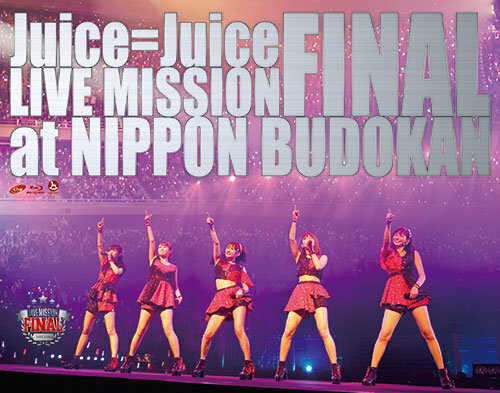 Juice=Juice were unfortunately not present at the event, so they missed out on those. This ‘Nacky profiling’ segment has actually been part of the show from the start, though it normally involves messages sent to the radio show. Getting feedback directly from her guests, right in front of her eyes, makes her nervous, so she’s not a big fan of this segment. But now that they’ve got to this point, Nacky asks them: Is there anything that they’d like to say to her? Sitting next to Nacky, Karin-chan comments on how fair her skin is. Nacky doesn’t think that it’ll get any better than this. Perhaps the sweat from her dancing helps rejuvenate her skin. Nacky turns the statement back on them – her guests have pretty fair skin themselves. Karin-chan’s known for paying attention to such things – is there anything she recommends for beauty? Karin-chan tries to vaguely recommend something while avoiding the usage of brand names. She uses things like CC cream and foundation from the same line of products. The CC stands for ‘Colour Control’, used as a less-concealing alternative to foundation. Nacky think that Karin-chan probably knows more about beauty than she does, and continues to ask Miyamoto-sensei what she does for hair care. Karin-chan has recently changed her shampoo to a silicon-based shampoo. It just so happened that Nacky was thinking about changing shampoos from her current one, which clumps up her hair. Since she hasn’t found any good ones, she hopes that Karin-chan can help advise her. The next letter brings up an incident where KanaTomo confessed her love to Karin-chan as a prank. 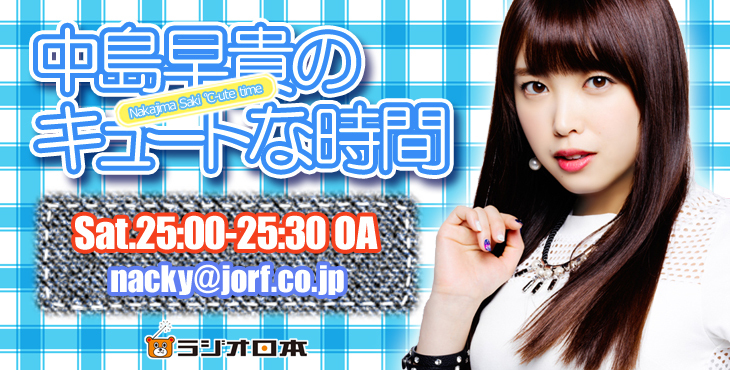 Do ℃-ute pull those sorts of pranks? Firstly, an explanation of the prank on Karin-chan. KanaTomo and Takagi Sayuki-chan enjoy pulling pranks out of nowhere. In this incident, Juice=Juice were staying over at a hotel. KanaTomo called Karin-chan up to confess her love, thinking that she wouldn’t believed. But it turns out that Karin-chan did get caught hook, line, and sinker, and ended up believing it for a whole day. Karin-chan got tricked because of how serious KanaTomo was. After the confession, Karin-chan called a friend to ask how she should respond to this interest by a fellow girl. Despite having a concert the next day, Karin-chan was up until the dead of night, worrying. After all that worrying, it turned out that it was all a prank. KanaTomo had actually discussed with Sayuki about what sort of prank to pull off. At first, they thought about saying that they had nosebleeds that just wouldn’t stop – but it would be troublesome if Karin-chan came to help them out. So it ended up turning into a confession instead. ℃-ute’s pranks tend to be birthday surprises. Nacky, Leader Yajima Maimi-chan and Hagiwara Mai-chan are all February babies. Around the time, the girls had an interview scheduled. When they got to the place, it turned out to be a surprise birthday party by members Suzuki Airi and Okai Chisato. It was a fun prank – nothing as serious as Juice=Juice’s. The next letter asks Nacky and Karin-chan if they still remember about what they thought about one another when they did the stage play ‘1974’. Or what KanaTomo and Nacky thought about one another when they first met on-stage, with KanaTomo as a winner of a karaoke contest – though Kanazawa-san probably was only looking at Airi-chan. In 1974, Nacky remembers Karin-chan as being the energetic little sister, and Karin-chan remembers Nacky as the older sister. Nacky has been getting a lot of interviews where ℃-ute look back on their activities thus far, and stage-plays really are a big thing to her. 1974 is a special play for her. 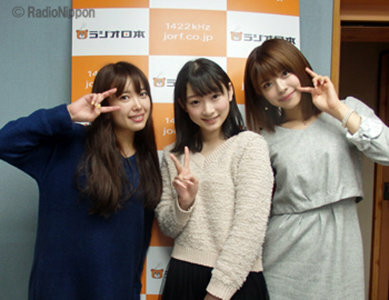 When KanaTomo performed as a winner of the karaoke contest, she sang ℃-ute’s parts together with Berryz Kobo. So Berryz Kobo left quite a big impression on her – she had only seen them on-screen, so it was strange. Natsuyaki Miyabi-san in particular left a big impression on KanaTomo. Miya really sparkled, with a powerful ‘entertainer’ aura. Her fair skin, her shining eyes, KanaTomo thought that she was someone from a completely different world. At the time, she never thought that she’d end up in the same line of work. Nacky: What a Cinderella story. Because of this week’s special guests, we instead have an Oyasumi Tomokorin instead! Karin-chan: Hey Tomo~ Let’s go to sleep together? KanaTomo: Uh, no~ Can’t you sleep on your own? Karin-chan: I can’t sleep without Tomo~!